MMT will be a ready to install application that will not require any initial training phase. 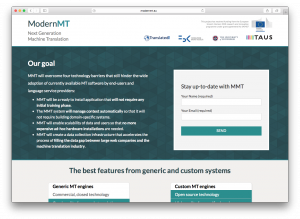 The MMT system will manage context automatically so that it will not require building domain-specific systems. MMT will enable scalability of data and users so that no more expensive adhoc hardware installations are needed. MMT will create a data collection infrastructure that accelerates the process of filling the data gap between large web companies and the machine translation industry. For more information please visit www.modernmt.eu. This project has received funding from the European Union’s Horizon 2020 research and innovation programme under grant agreement no. 645487.